A typical case of intramuscular myxoma has a mucoid, gelatinous appearance due to the abundance of myxoid matrix. In cases where collagen predominates, the appearance is more fibrous (shown here). 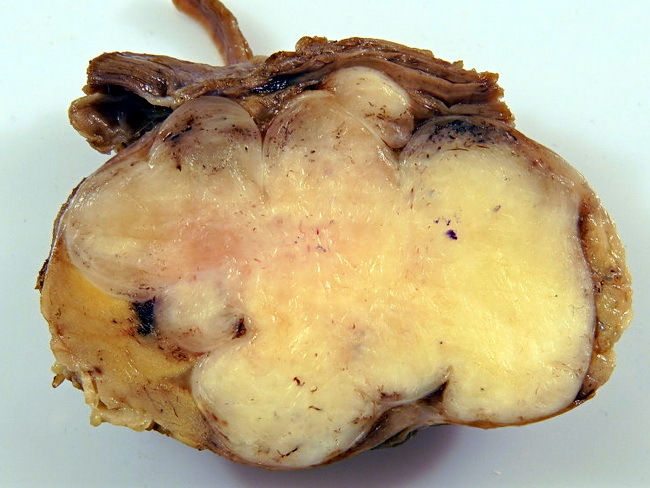 This 8 cm tumor involved thigh muscles in a middle-aged man. Despite its circumscribed appearance, it infiltrated the adjoining skeletal muscle (top) microscopically. Image courtesy of Bulent Celasun, MD, Ankara, Turkey. Used with permission.